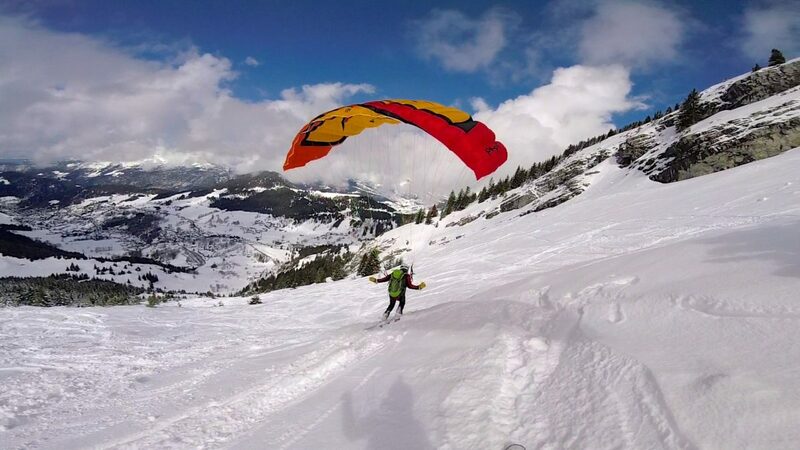 The Pil-Pit is known for a long time in the speedriding world, thanks in particular to the success of the 1st generation. 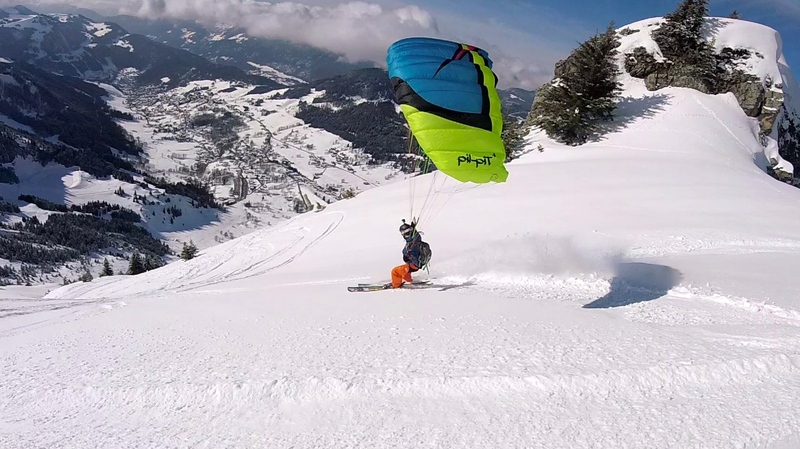 The 2nd and 3rd generations of Pil-Pit are very different from the first one (see article Pil-Pit 1, 2 & 3) and are characterized by a strong dive and a wing that tolerates skiing at high speed but whose glide is not exemplary. The Pil-Pit 4 finally reconciles the 3 generations of Pil-Pit to make a complete and accomplished wing, with its own character. Sizes 8 and 9.5 are for experienced to expert pilots. They have been designed for this purpose and independently of sizes 11 and 13 which have been created for beginner to intermediate pilots. Although there behaviour is very similar, we noticed the difference when we tested the 9.5 and 11 m2. The risers are still in simple black straps, and for the first time in 3 lines on the Pil-Pit 4, so 3 rows of risers. The brake handles, which are connected by magnets placed just above the pulleys, are also simple straps, stiffened to facilitate the grip of the handles in “flushing mode”, which is however not to everyone’s taste and often not even recommended. The trims are very big, they are almost 18 cm and offer a huge speed and dive range. 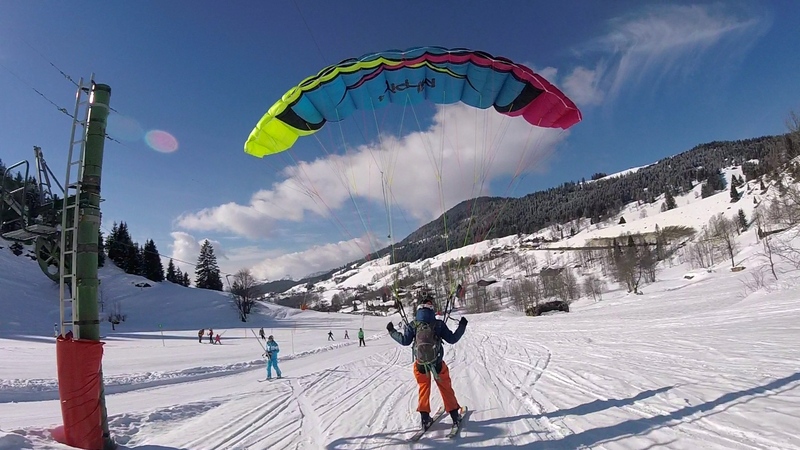 They are very easy to handle because they are well placed, but difficult to adjust precisely and symmetrically in flight or during the ski phase. For example, if you need to fly closed trim to reach a place and quickly open the trims to exploit the slope, you can use small clamps as stops, that will facilitate the precise opening of the trims to the desired setting. 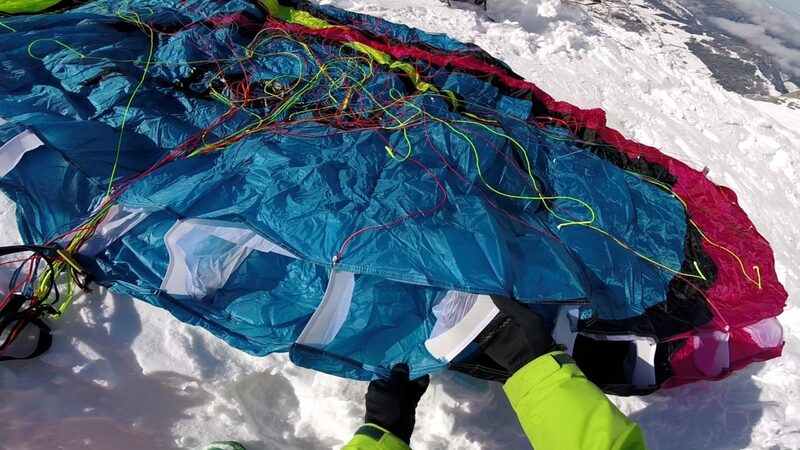 The lines are entirely sheathed and of different colors, which facilitates the untangling and decreases the risk of cut by the edges of skis. The aspect ratio of 3.5 is in the average, the vault of the profile is marked but without exaggeration, offering a rather progressive rate of fall in turn. 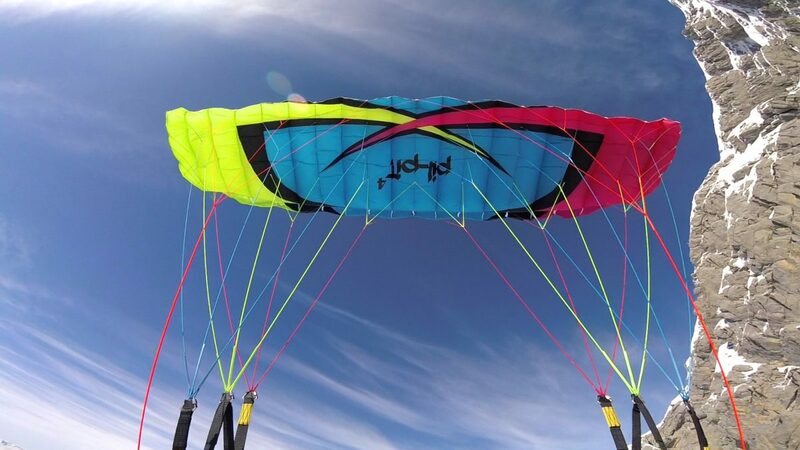 The Dominico’s tissu offers a good weight/robustness ratio and the whole wing is of good quality and finish. 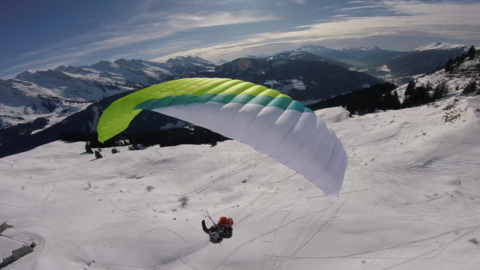 On take-off, the wing rise well and is easily positioned above the pilot. It does not require too careful preparation, on the contrary. 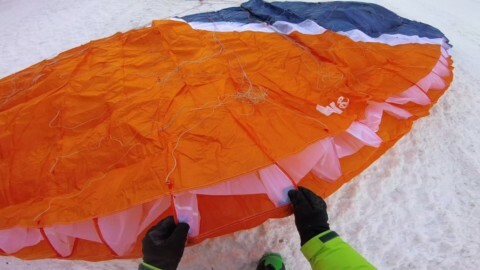 A little preparation in plug will be preferable and will avoid that one half wing inflates before the other and pull the pilot in the slope, especially with the 11 (but it is often the case on many wings). 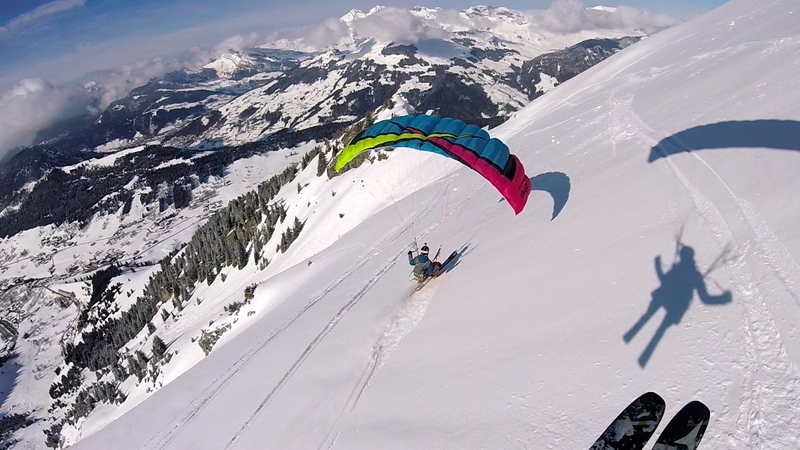 The take off is late to avoid getting off in an untimely way during the ski phases. To take off, it will be necessary to pull the brake without too much shyness, but after a good speed gain. Closed trim, the wing is pitched up to the maximum and it is better not to apply too much brake to avoid any risk of stall. With only a little brake, you get a correct glide (better than on previous versions) that will suffice most of the time. We’re still a little below the average of most of the other wings on this point. Half trim (or about : a few notches before or until the yellow line), the glide is degraded but returns easily by pulling the brake or by pulling on the rear risers. Open trim, speed and dive are huge but it almost feels like you don’t have much control, especially with the 9.5, and you quickly put back 2 or 3 notches to find a consistent behaviour. The barrel rolls turn well but nothing exceptional, they are rather fluid but not very fast and it will be necessary to keep a good margin, especially cause the wing dive after the barrel to take speed again. Finally the barrel goes as well on the 11 as on the 9.5, it can be done in the pitch surge after a good speed increase. This pitch surge is much more present on this Pil-Pit 4 than on previous versions. Don’t be shy with the brake handles to find a nice pitch surge after a good speed gain. 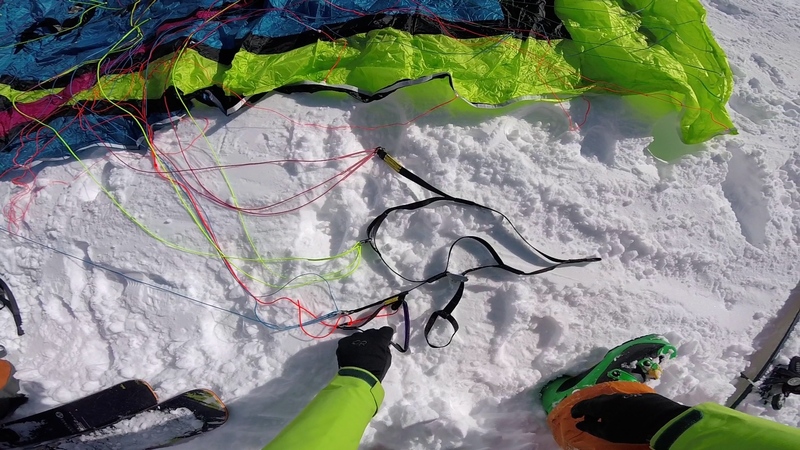 The pitch surge makes it possible to slow down well and land gently even if it’s still a bit fast. The regulars of Pil-Pit 2 and 3 will need to find their marks a little because the glide is better on this Pil-pit 4 when you pull the brakes and it lengthens the distance of landing. You can reduce the landing distance by letting the wing dive and by making a deep and late rounding. Once the skis are on the snow, we notice that the controls are high. They are softer than in flight but remain quite hard and transmit the necessary information well. On the 9.5, the travel is short and lacks a little progressiveness, it is necessary to pilot with skills not to stall half wing at low speed. On the 11, there’s more tolerance, more travel. 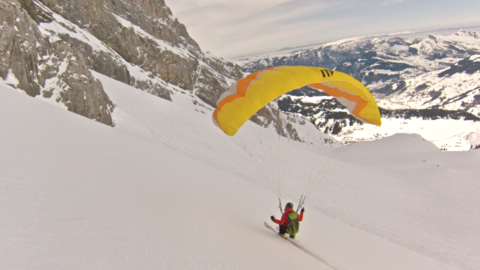 We lose a little in reactivity compared to the 9.5, but the wing remains very handy and still follows the skier very well. The roll is present but nothing extrem. 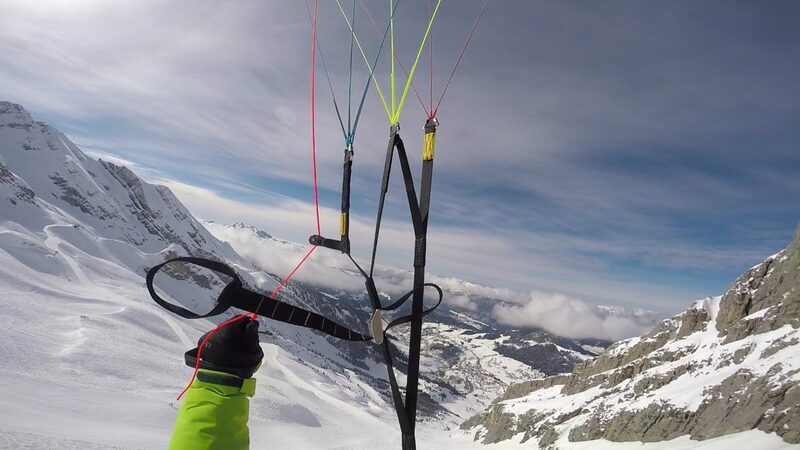 This does not disturb the phases of skiing, do not insist too much on the brakes to tilt the wing (especially with the 9.5), it is better to take the angle on skis and let the wing follow the movement by gently accompanying to the brake handle. 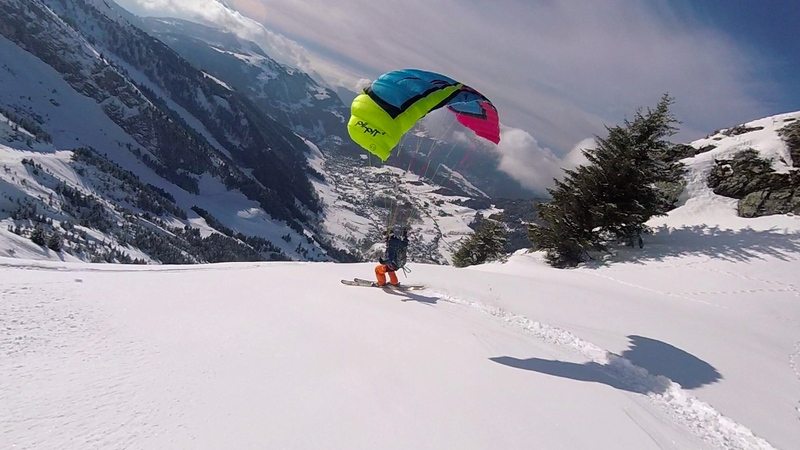 The 9.5 is very reactive on the yaw axis, sometimes even too much; on skis, the wing turns by itself at the same time as the pilot and without much intervention on his part, which is quite destabilizing when you are not used to it. 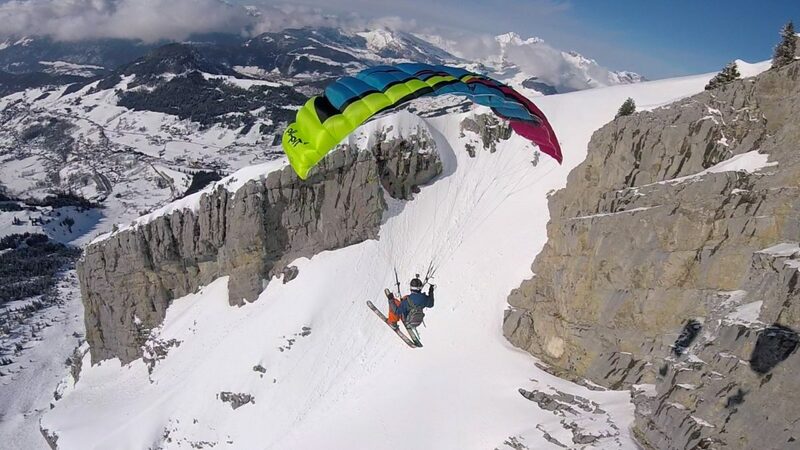 But once you understand that it is enough not to over-pilot, the sail is forgotten and really let you ski. 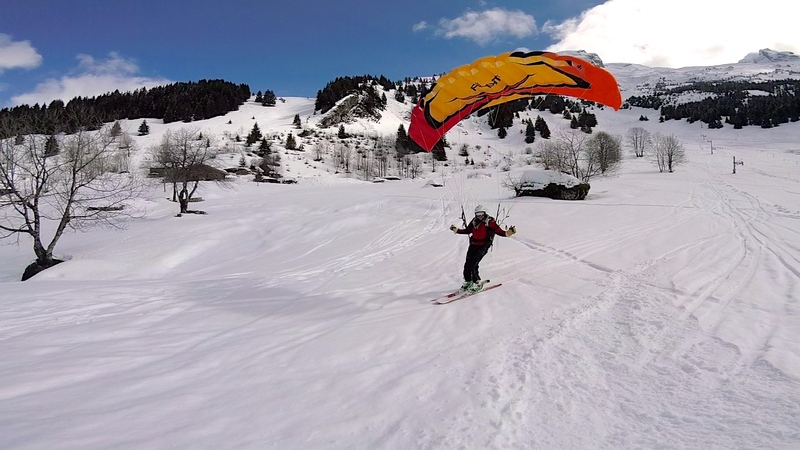 It follows the skier in his movements, whether in large curves or tight turns, or even in sculling, giving the sensation of riding under an 8 m2. The 11 is more moderate on the yaw axis and has a more classical behavior. 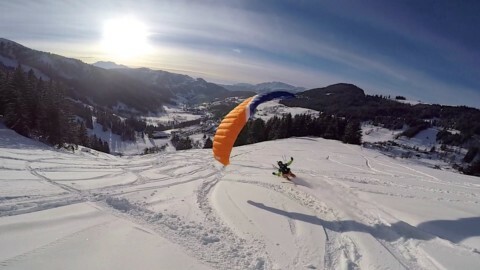 However, it follows just as well and also leaves a lot of room for skiing in large curves as in small bends, without untimely handling even on steep slopes. 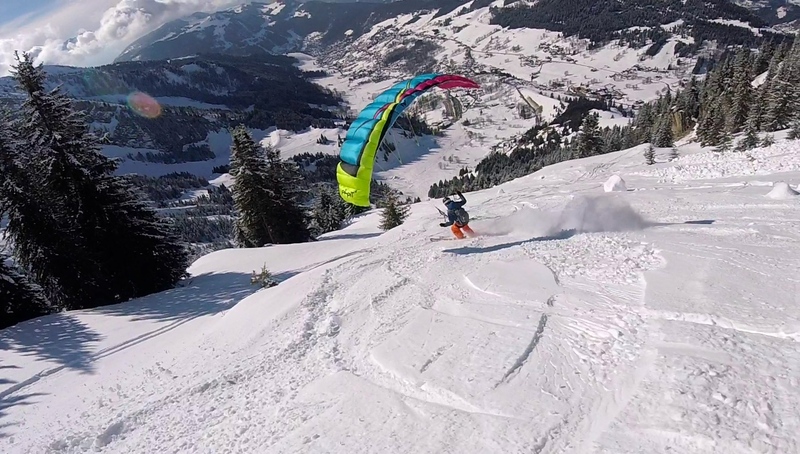 It feels like riding a 9.5 under this 11, and the fast and slow skiing phases follow each other very well. Low speeds are well tolerated by the Pil-Pit 4 (better than on the 2 and 3) even though it feels more comfortable in fast skiing. 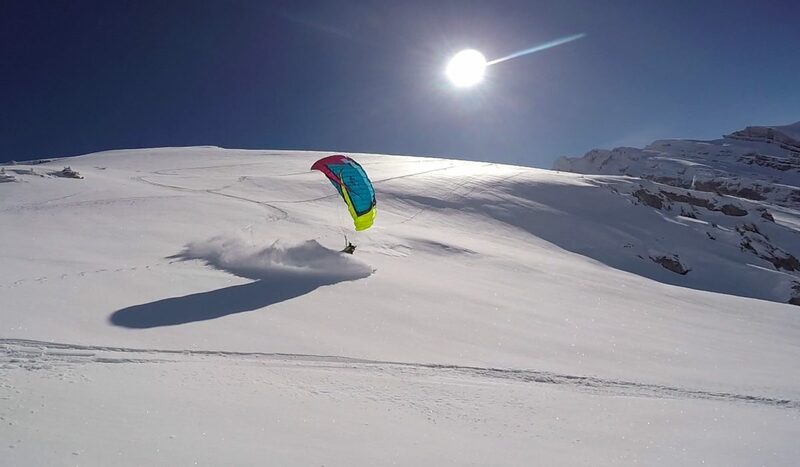 If we don’t over-pilot, we can really manage to ski very slowly even on chaotic terrain where the sail is going to undergo big load shedding. However, you really have to avoid pulling the brakes too much at low speeds, to avoid half-wing stalls that occur a bit without warning. 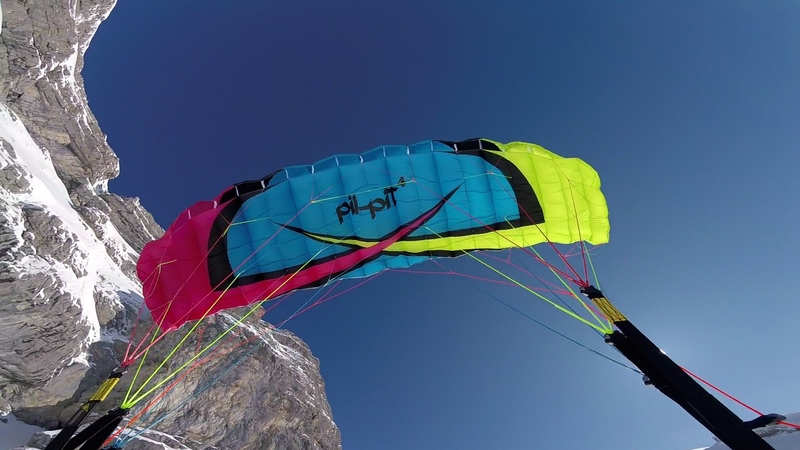 Unlike the Pil-Pit 3, the 4 does not pull back abruptly when it stalls and therefore destabilizes the pilot less, most of the time it is enough to raise the hands so that the wing rises above the head. The trim setting is very important on this Pil-Pit 4. 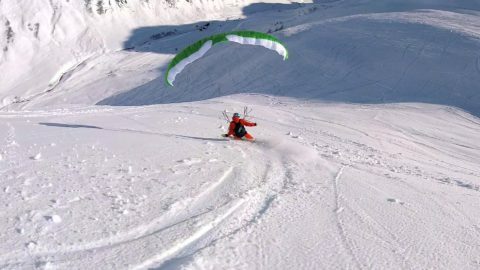 By finding the right setting for the slope you want to ride on, you can really enjoy skiing without having to pilot the wing too much. It is better to open too much than to close too much the trim, because it still want to stall more than overtake. It is between the 2nd notch of trims and the yellow line which materialize the middle of the trims that we found the most pleasant behavior. 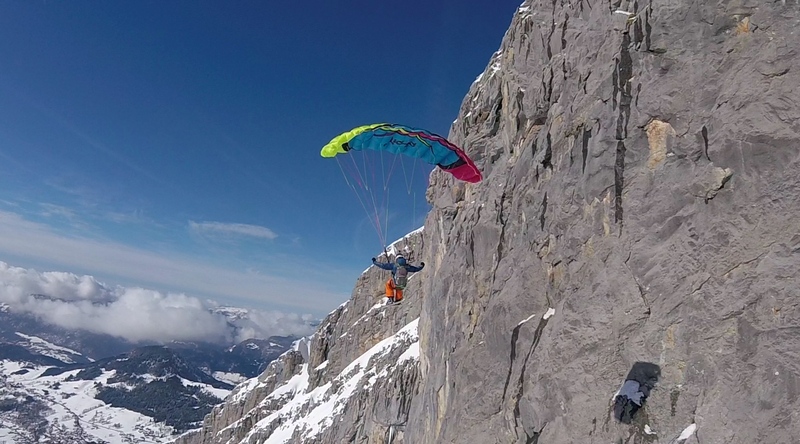 Foot launch (speedflying) will be possible in the large sizes thanks to the pitch surge, but a big experience and a good preliminary knowledge of the wing will be necessary. 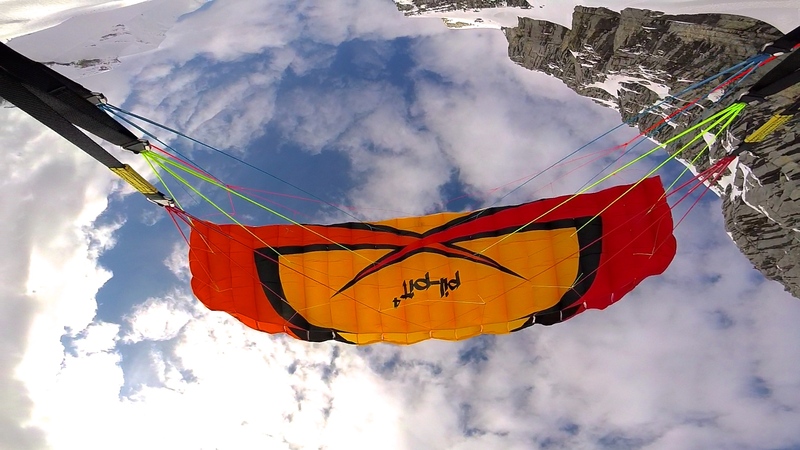 Be aware of the high reactivity of small sizes on the yaw axis when flying very close to the ground. It is preferable to set the trim between 2 and 4 notches to avoid any risk of stalling and to have a good energy for the pitch surge when landing. The Pil-Pit 4 is, like the first generations of Pil-Pit, a wing of character that is best tried to make sure it suits your riding style. 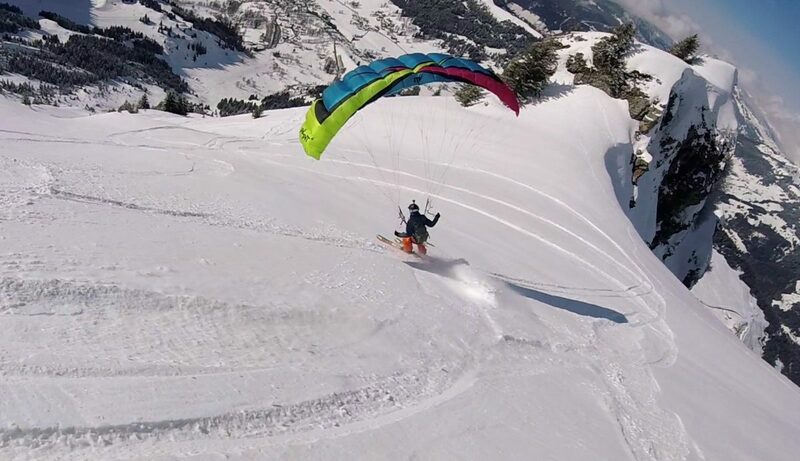 It is in any case a wing which will delight the confirmed skiers who look for a wing which is made for skiing, whether it is fast, slow, in steep or gentle slope, large and even in narrow corridor. 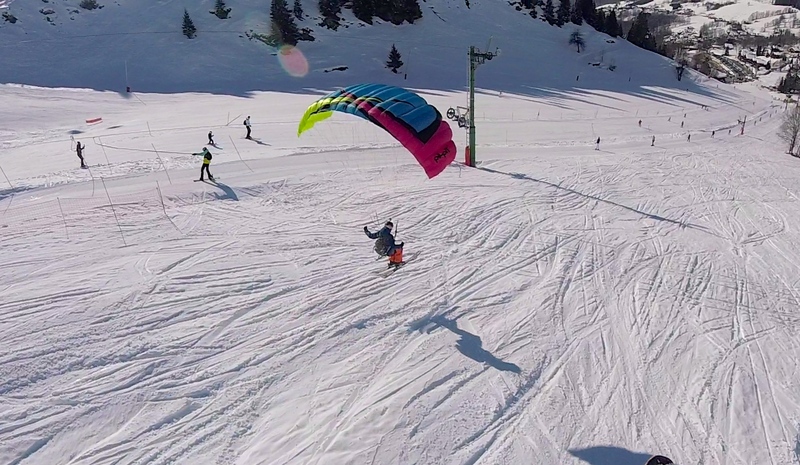 Not all wings feel so light and small on top of the head while skiing. We still have a preference for the 11 whose behaviour seems more coherent, and which is very discreet for a wing of this surface. For any ITV’s wing test, do not hesitate to visit the ITV Test Center, now renamed Mika Shop. The after-sales service is pleasant and efficient, and the inspection and repair workshop located in the ITV premises in Doussard make them very reactive.